Oh joyous day! Sing, choir of angels! Just do something jubilant, because those kind executives over at the Coca-Cola company have kindly—benevolently allowed us another chance to purchase the greatest non-alcoholic beverage of all time, Ecto Cooler, just in time for the new Ghostbusters movie to premiere on July 15. This has been rumored for a while now, but for anyone who drank the beverage—sweet, tart, a color that could not possibly exist in nature—knowing that we’ll finally be allowed to shovel wheelbarrows full of our cash to the Coca-Cola company to purchase this product is wonderful indeed. 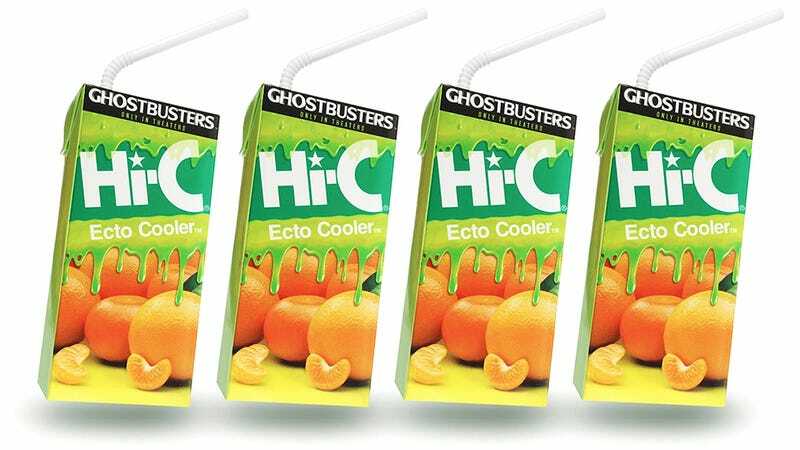 If you haven’t accepted the glory of Ecto Cooler in your life, chances are you were either too old to be drinking Hi-C “fruit” “drink” when the flavor debuted in 1987 (originally promoted alongside the Real Ghostbusters cartoon), or too young when Coke discontinued it in 2001 (a full 10 years after the cartoon went off the air; that’s how good it was). Since then, lovers of the drink have been trying to recreate the poisonous hue and deliciously artificial flavors to varying degrees of success. But now their work is done. I DON’T CARE ABOUT YOUR CHEAP MARKETING TRICKS, GUYS. I JUST WANT THE DRINK. WHICH, ADMITTEDLY, WAS ALSO ESSENTIALLY A MARKETING TRICK. I fully expect this stuff to sell out instantly and ceaselessly, thanks to an insane horde of 30-somethings (myself absolutely included) trying to stockpile the drink in case of another 15-year drought. We can only pray that the Coca-Cola company will make enough product to bestow upon us the great kindness of allowing us to give them our money.